DrcStudio can be contacted by phone at: 217.753.0409 or 615.953.4754 between the hours of 10:00 AM & 7:00 PM CT, Monday through Saturday; or anytime by using the contact form on the right. Dropbox Pro - Client audio files for mastering upload to DrcStudio. Click here now to request a custom quote! All visits are by appointment only and are subject to studio availability; please contact us in advance to schedule your meeting or session, and to obtain directions to our Springfield location. POLICY: DrcStudio is available for hire by appointment with a paid deposit; subject to studio availability. New clients must pay a non-refundable 50% deposit when booking their session. Client cancellation less than 48 hours in advance of their scheduled session will be billed for 100% of the time booked. Work performed on Sundays or Holidays may be billed an overtime surcharge or additional minimum hours. Special recording bundles offered by DrcStudio (including gift certificates) must be purchased in advance of scheduled session(s). All sales are final. CASH & CREDIT TERMS - Clients who have not established credit must pay by cash, check with current photo ID, or money order. Credit and debit cards are also accepted. SALES TAX - Applicable city and state sales tax will be added to all charges. MATERIALS - Materials provided by clients are received and used by DrcStudio at the client's risk. 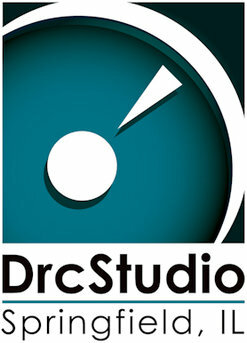 DrcStudio will store client's materials free of charge for up to one year following the date of the session. While DrcStudio will exercise all reasonable care with these materials, DrcStudio does not accept responsibility for loss or damage to materials from any cause. ARCHIVING & TRANSFERS – Archiving is required of all sessions. Premium archiving is the backing up of all relevant session data to the DrcStudio network hard drive on an ongoing basis. Upon final completion of the client's project, all data will be permanently transferred to client's external hard/flash drive. Basic archiving is the one-time transferring of all relevant session data to client's external hard/flash drive upon final completion of the client's project. The client must sign off on which type of archiving they want prior to the start of their project. At any time, the client may choose to transfer archived data to CD, DVD, Blu-ray or client's external hard/flash drive (additional fees apply). Fees for archiving and transfers may be obtained by contacting DrcStudio. All archive media storage is the sole responsibility of the client. DAMAGES - DrcStudio assumes no consequential damages. Under no circumstances shall DrcStudio, its employees or agents be liable to anyone for lost profits, special incidental, indirect or consequential damages resulting from (a) defective elements, products or equipment delivered, produced or provided; (b) loss, theft, damage or destruction of elements, whether or not such defects, loss, theft, damage or destruction are caused by negligence of DrcStudio, its employees or agents. DrcStudio is liable for cost of replacement materials only. Equipment and media storage devices purchased from DrcStudio are warranted only by the manufacturer. LIABILITY LIMITS - By supplying production elements and media to DrcStudio, client represents that they have permission to use all elements and media. DrcStudio has no responsibility for the content or exhibition of client's materials. Client agrees to indemnify, defend and hold harmless DrcStudio from all suits, claims, demands and other liabilities and expenses arising out of or in connection with work for client. This indemnification shall include, without limitation, claims for libel, slander, defamation, invasion of privacy, or infringement of copyright, servicemark, trademark or other proprietary right. PROMOTION - Unless specifically denied in writing, client grants DrcStudio permission to use client's name and portions of client's recordings produced or assembled by DrcStudio and its employees or agents for promotional purposes. DrcStudio is a drug and gun free facility.